Our Boxer figure is modelled on the great heavy-weight fighter Mike Tyson. He stands in a classic boxing pose. This detailed model even has real silky boxing shorts. 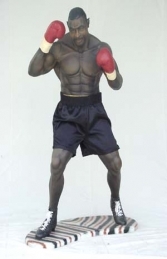 This 3ft boxer made from cold-cast poly-resin and fibre-glass 3D model of a look -alike Mike Tyson boxer is ideal for American sports themed displays.